5 stars 14 stars 03 stars 02 stars 01 star 0(out of 1 review) 1 of 1(100%)customers would recommend this product to a friend. 5 stars 24 stars 03 stars 02 stars 01 star 0(out of 2 reviews) 2 of 2(100%)customers would recommend this product to a friend. 5 stars 34 stars 03 stars 02 stars 01 star 0(out of 3 reviews) 3 of 3(100%)customers would recommend this product to a friend. Actually, L, we purchased a bucket with 200 vegan meals for $60.00 from our local Costco last Saturday. Was gonna post about it but got busy and forgot. It is packed in a bucket and has a shelf stable life of 20 years. I'm looking for more of these items at my local Costco. They only had the vegan meals available this time but the price was just too good to pass up. I have meat stored and can always add some Spam or vienna sausage to them. They are low in carbs, high in protein, and low in fat. Perfect for East Texas. Blue when you get a minute can you see if you can find what you bought on the costco website and post here? $15 discount is reflected in the price. Valid for orders placed March 26, 2012 through April 15, 2012. While supplies last. Along with the enhanced flavors, Food for Health has also increased the nutritional value as well. Each entrée is high in protein and offers no hydrogenated oils(excludes whey milk), trans fats, or added MSG. Making a healthy meal has never been so easy or affordable. 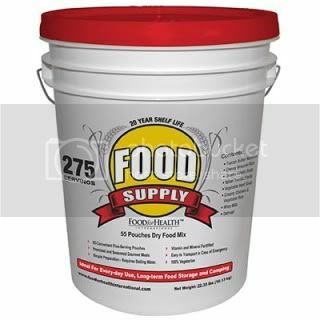 Just add boiling water, and in 25 minutes, a mouth-watering meal is ready to serve; priced under 35 cents, Food For Health's Food Supply Kit easily fits into any budget. Our company's name reflects our commitment of providing food that promotes optimal health, increased longevity, and a sustained quality of life. Note - I paid $59.95 in the store. Thanks blue I wonder if they ship in Canada? Don't know, L. But you could always e-mail them or call. BTW I made a mistake above - mine only has 200 meals not 275. I have not seen these items in my local store but they are available on line. WOW did they ever step it up..